Interview with former Finance Minister, Ronnie de Mel, published in the Nation on September 25, 2016. Former Minister of Finance and one of the chief architects in introducing and establishing an open economy in the country, now a nonagenarian at 91, Ronnie de Mel spoke to Nation about the challenges faced in transitioning the country from a closed economy to an open one, the alleged debt trap, whether austerity measures were a solution and how the Government could generate revenue. Q: Are there any parallels to the transitions the country is presently going through with the situation faced in and during the introduction of an open economy? At the time when the open economy was introduced in 1977, Sri Lanka had gone through a very bad period of a semi-Marxist State without some of the extremisms of Marxism. Even the very concept of a free or open economy had been forgotten by large sections of the people of the country and by very large sections of the press. Introducing it was akin to taking a leap in the dark as far as the people of the country were concerned. Q : How did you obtain the support of the international community with regard to the country’s economy? It was not very difficult to convince the international community to support an open economy because the majority of the countries that mattered in an economic sense already followed an open economy. The major challenge faced was not in convincing the international community but in convincing the people, the public opinion and the Press in particular about the benefits of the open economy. 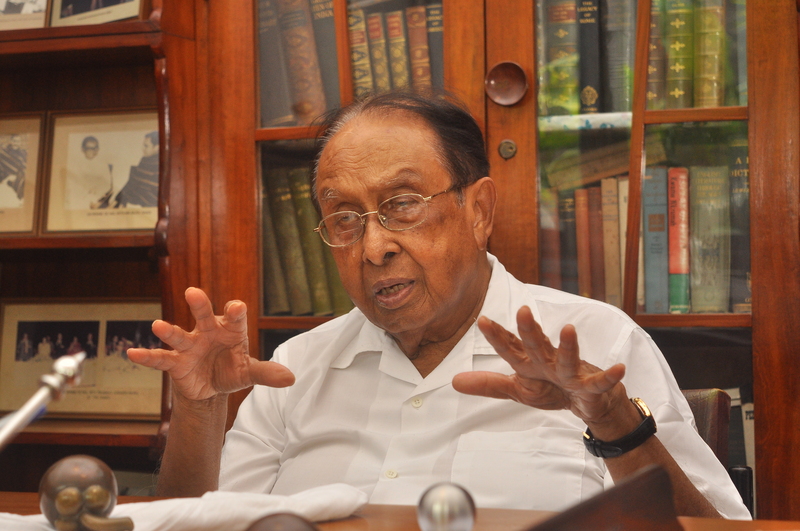 The whole country, its people, its Press and in the opinion of the public, they had all got so used to a closed economy that it was rather difficult to convince them that an open economy with certain restrictions would be better for Sri Lanka than the closed economy which had been in existence for a long period and was strongly supported by the Leftist parties and by a powerful section of the Sri Lanka Freedom Party. People in Sri Lanka had virtually forgotten the benefit of an open economy. It took a little time and much effort to convince them that an open economy with certain safeguards to protect the poor would better serve the country in the long run. Even more difficult to convince was the Press, which had almost swallowed the closed economy, hook, line and sinker. It was therefore a very difficult switchover at the start. In fact, it took a long time to convince the press that the open economy would be better for Sri Lanka than the closed economy. As has always to be emphasized, it had to and has to be an open economy which would safeguard the poor. Q : What were the issues the Government envisioned at the time as ones which could arise in the times to come as a result of the introduction of the open economy? All sorts of issues and difficulties would definitely arise in converting a poor country like Sri Lanka from a closed economy to an open one. A large section of the people, a large section of the Press and a large section of the intelligentsia had got so used to a closed economy that they were not very easily welcoming of an open economy. A closed economy had almost become a fact of life. The Press in particular was not very sympathetic or helpful at all to us during the transition because a very large section of the Press had become so used to Marxism and Marxist ideas that only very few of them were prepared to change. Q : How has the concept of the open economy evolved in the country since its introduction? The country has developed by leaps and bounds since the introduction of the open economy. It would be almost unthinkable as to what Sri Lanka would have been if not for the open economy. It might probably have been far worse than Venezuela or some other such country. Q : How can the country get out of the debt trap it is presently engulfed in? I do not think that it is at all difficult for Sri Lanka to get out of a debt trap. This is a creation of the Press. If such a fallacy exists with correct policies and programmes and correct implementation of those policies, Sri Lanka can easily repay its debts without any difficulty. Q: Are austerity measures required? I do not think it is necessary for Sri Lanka to reduce its present welfare policies in any drastic manner. People are more important than policies and it is always our duty to look after the people first.